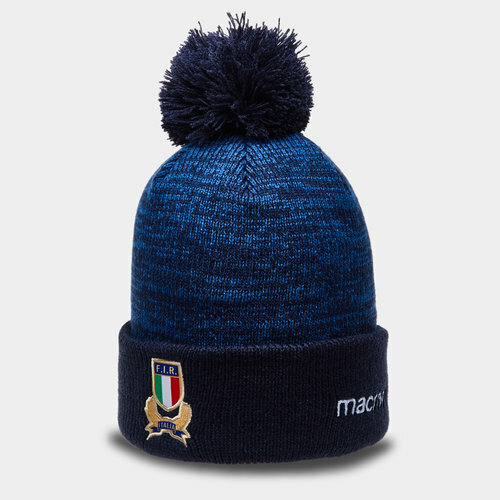 Show your pride for the Azzurri whether you're out and about or ready for action at the Stadio Olimpico in this Italy 18/19 Players Pom Pom Rugby Beanie from Macron. The international rugby team Italy have collaborated with Macron for kits and training attire since 2017. Italian rugby really came to prominence in 2000 when it was added to the Five Nations, creating the Six Nations. Initially, on the end of some heavy defeats, the side has grown in competitiveness, recording a fourth-place finish in 2007 and 2013, and even in defeat, lop-sided losses are less frequent. This soft hat will keep you warm in cold conditions. It is the ideal item to be worn on cold winter days to support your team during match days. The hat is made from 100% acrylic and comes in a royal blue marl colour with a navy pom pom. The hat has been finished with the macron logo and the Italian team crest.